Local cardiac patients will get some love this February through Heroes for Healthy Hearts, CoxHealth’s new program to raise funds for those who need it most. 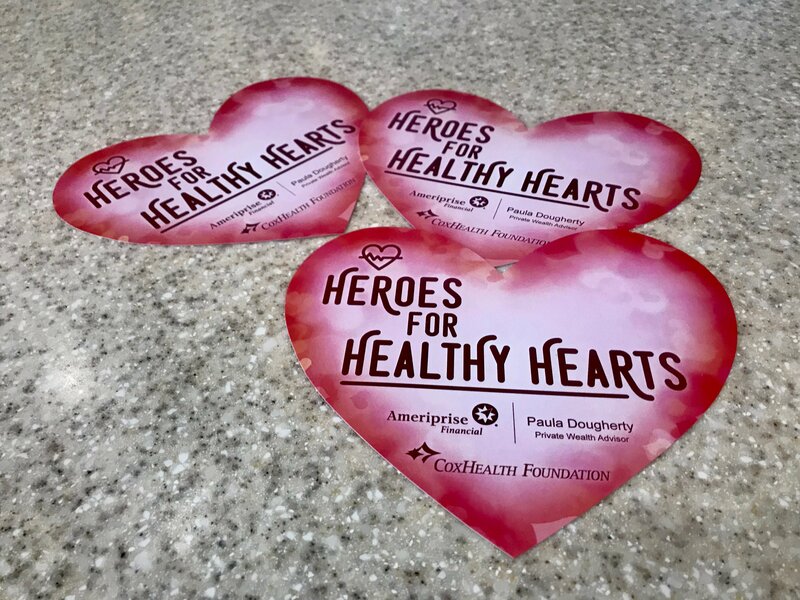 Throughout the month of February, CoxHealth employees will take pledges for $2 paper hearts, which will be displayed throughout hospital facilities. The community as a whole is also invited to support the campaign by purchasing hearts from a CoxHealth employee, at the Wheeler Heart and Vascular Center, or by buying them online at www.coxhealthfoundation.com. All of the money raised will stay in southwest Missouri to help cardiac patients – after events such as heart attacks – who need assistance paying their medical expenses. This can include medical bills for care, rehabilitation, medications and more. There’s also an edge of competition to this effort. CoxHealth employees are encouraged to compete against each other to see who raises the most funds for patients, with both prizes and bragging rights at stake. Other events – such as "red-out" day -- encourage everyone to wear red for awareness. Additionally, a chili cook-off will also be held Feb. 14, along with a basket auction, in Foster Auditorium at Cox South. The community is invited to attend the chili cook-off from 11 a.m. to 1:30 p.m., and a $5 ticket gets each attendee a bowl of chili, as well as up to three samples from which they can vote for their favorite.